In Jenny Eden and Polly Tomlinson New Work, the two artists explore the manipulation of materials in their respective art works. They push the limits of the materials, creating intriguing and captivating forms. Despite their different mediums of painting and sculpture, their work successfully comes together to create a whole idea: that the material is the essence of the art. 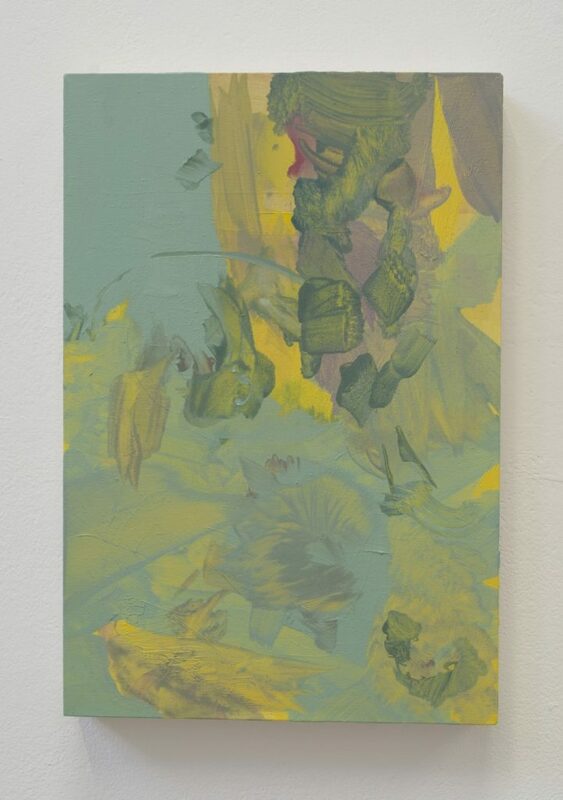 There is energy in Jenny Eden’s paintings. The process of creation is revealed in the mark making and the layers of paint, while her use of organic colours suggests the growth of something within the paintings, be it a natural or abstract being. There is softness created by the dominating pastel tones and visible brush marks. The way different colours are applied builds up layers in the artwork. In ‘Cuckoo Spread’ faint washes of grey contrast with more solid blue, emphasising the versatility of the paint and how it can be manipulated. Eden’s work explores the relationship between different tones and how they enhance each other; darker swipes of colour cut through the delicate pastels in ‘Can Toy’, creating an earthy depth. Polly Tomlinson’s sculptures provide evidence for the energy involved in creation. Sheets of metal, a material that is strong yet often manipulated, are bent, beaten and forced into abstract forms. 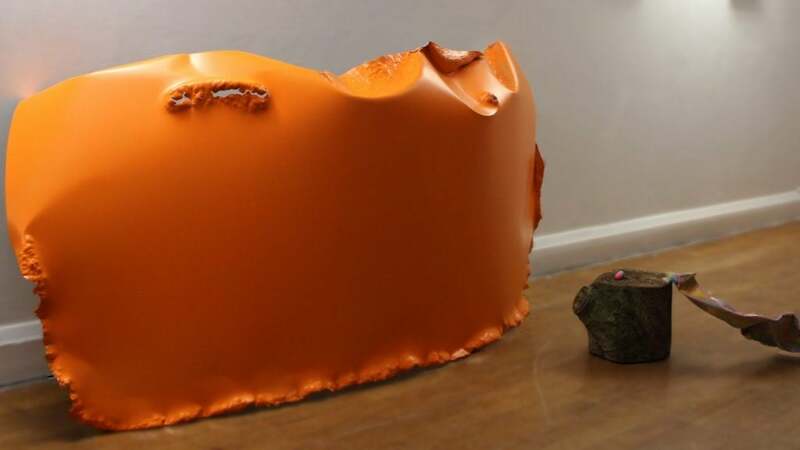 The scale of the sculptures varies from large, industrial-sized pieces of metal with smooth expanses and crumpled edges, to more organic shapes which curl in on themselves. In several sculptures, Tomlinson explores the relationship between metal and other materials. ‘Enfold’ features a shell-like form wrapped in a net of cotton thread, the flexible combining with the inflexible. In ‘The Palisades’, colour and shape are experimented with. A folded sheet of metal is spray painted blue, transforming the material into something reminiscent of melted plastic. 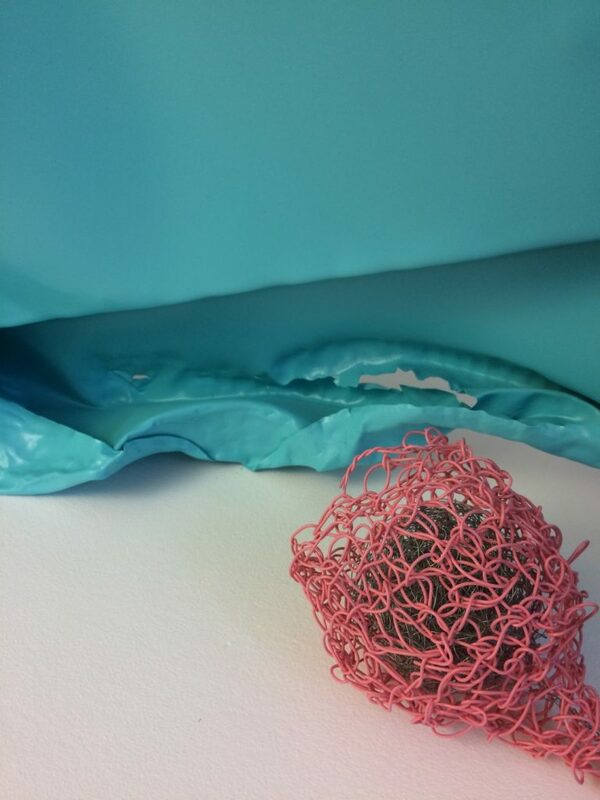 In front sits a knot of pink wire, its twisted strands conceal a ball of grey wire, as if it were a metallic seed pod. The two artists’ works interact with each other in the exhibition. The shapes of Tomlinson’s manipulated metal echo the 2D abstract forms contained within Eden’s paintings, while difference is created by the artists’ use of colour. There is a perfect balance between contrasts and similarities. The exhibition is at the Cornerstone Gallery, Liverpool Hope University, until the 31st January 2017. There is energy in Jenny Eden’s paintings. The process of creation is revealed in the mark making and the layers of paint, while her use of organic colours suggests the growth of something within the paintings, be it a natural or abstract being. Polly Tomlinson’s sculptures provide evidence for the energy involved in creation. Sheets of metal, a material that is strong yet often manipulated, are bent, beaten and forced into abstract forms.